Better late than never, as they say..
Last Saturday I attended a blogger meet up organised by the lovely Alice & Amy - who did a fabulous job I must say. Myself and 22 bloggers met @ Orange Rooms Southampton, a restaurant by day and partaaay venue by night. We sat enjoying cocktails the sunshine (once in a blue moon opportunity in the UK) chatting and getting to know each other before we headed upstairs to the Tiki Bar where we were quickly served the most amazing food, the best part, it isn't even expensive. I'll be returning fo' sho'. Alice & Amy hosted a raffle with some amazing prizes up for grabs, congrats to all the lucky winners! The goodie bags, well, let's just say, overflowing greatness. I was convinced that the bag was bottomless, a never ending dream. So many amazing brands got involved such as Benefit, Decleor, Elf, Miners, Argan Dew, Topshop - just to name a few. I'm super excited to try out all the products, they will certainly last me a while. Bearing in mind, very few people knew each other before the meet up, the day was a complete success. It was so lovely to meet lots of fellow bloggers, especially as they're the ones who don't think you're talking absolute rubbish and actually understand the concept of blogging, can I get a WOOP. 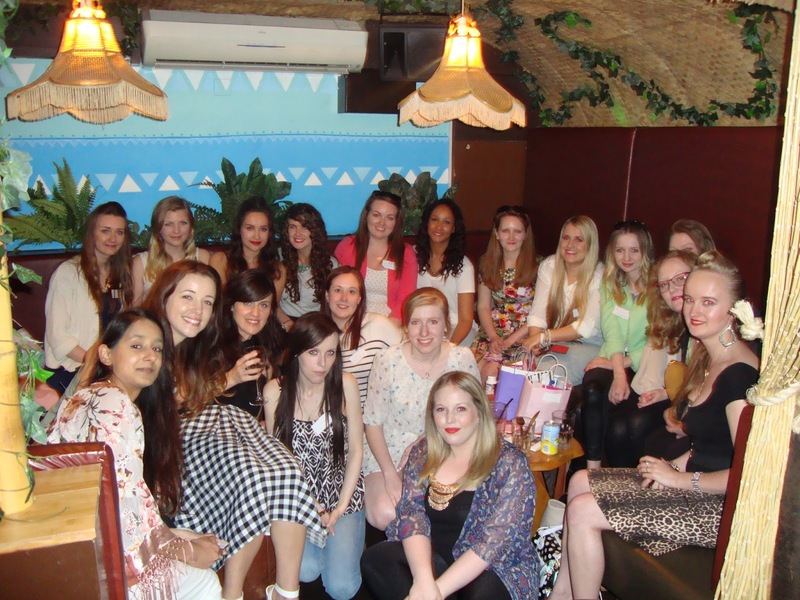 Thank you to the girls for such a fab afternoon, looking forward to the next meetup!